My Personal Best Salmon: 41 Lbs.! She was a monster at 41 pounds! I was overdue… I’ve been singing that song for three weeks, now. I had spent two overnight fishing trips on the hot salmon spots of the Delta the past three weeks, trying my best for an early salmon. It just didn’t happen. Maybe I needed a bit of help. For this trip I invited my ol’ fishing buddy “FishTracker” Rich to go along. I would make the usual two day trip, and Rich would meet me at Vieira’s dock the morning of the second day before sunrise. Maybe he’d help change my luck. Another photo of the same monster. I launched at Rio Vista late Tuesday morning into a light chop and the usual breeze. I began my troll just below the Rio Vista Bridge and worked the east side upriver to the mouths of the Old Sacramento River and Steamboat slough. I marked several large fish, it appeared to be a promising day. I was trolling up the Old Sacramento by 1:00 p.m., and saw the first hookup of the day near the mouth. One fella was fighting what was no doubt a salmon while his buddy stood by on deck with a large net. That was a good omen, the first hookup I’d seen this year. I continued trolling upriver past Vieira’s Resort, past Isleton, past the Isleton Bridge, and on up a couple of miles or so beyond the bridge. Zilch. I continued to troll and troll those areas until sundown. More zilch. Discouraged but optimistic, I anchored for the night near the Isleton Bridge, next to the white metal pilings just downriver from the bridge. It turns out that this is a fine anchorage, well sheltered from the wind and very quiet. Tomorrow would be my big day, I told myself. Again. Wednesday morning before first light I was idling downriver to meet FishTracker for a hot breakfast at Vieira’s and another day of trolling. It’s not often that I boat on a dark river, but on the occasion that I must, there is nothing so comforting as my radar and GPS chart plotter unit. I used them both and still kept my speed quite slow. This fall and winter they’ll again be very handy to have in the fog. At 6:45 a.m. we were on the troll. We headed upriver full of good cheer and ready for some action. I was trolling a blue Wiggle Wart, Rich was trolling a red one. About an hour later my tenacity was about to be rewarded. As we approached the boat ramp in Isleton, I headed the boat into the river, away from the bank to avoid the underwater hazards that are in that area. It appeared that Rich’s lure was hitting the bottom and he raised his rod high to avoid any snag. But the action on the rod tip wasn’t the bottom, it was a fearless little small mouth bass that took Rich’s Wiggle Wart. He measured just nine inches or so, but his aggressive nature was incredible. And then my moment came… at last! At about the time Rich was removing the little bass, my reel started singing and my rod bent to the weight of something substantial… and it was about time! I grabbed the rod at once as Rich took the boat controls. Whatever it was, for twenty minutes or more, me and that big fish had us a donnybrook! When it finally made it’s first appearance near the boat, we saw a mighty big salmon! “It’s a 20 pounder!” I announced. Rich disagreed with the captain, “It’s a thirty pounder… no, a thirty five pounder… maybe more!” he exclaimed. We’ve neither one ever caught a salmon much over twenty pounds – what did we know? After it’s first appearance at the surface, it took several more minutes to get it back to the surface. I don’t think I’ve ever fought a fish so intent on staying under the boat and near the outboards. I told Rich that I thought this must be an experienced fish, he seemed to know just what to do to frustrate me. Finally, tired but still struggling, the beast came to the boat one last time, and Rich had it netted. As we raised it over the gunwale and onto the cockpit floor, we realized that we’d just boated a really, really big salmon. We’d never seen anything quite like it. I grabbed the scale and struggled to get the big fish up. Rich read the scale… forty five… no forty… forty one pounds! Wow… success at last, in spades! As often as I fish, and as hard as I seem to work for memorable catches, I knew right then that this was one of those rare, lifetime catches. I’ve really been working for my first salmon of the season. What a payoff! And this was just the first fish of the day. Ha! What goes around comes around, they say, and this situation was very interesting for Rich and me. Here we were once again facing the issue of “welfare fishing”. Last year I wrote a report about one of our trips when FishTracker offered me his rig when the second salmon of the day had hit the same lure… his. I reported then on the philosophical questions that pop up in such a situation. Even though I had clearly stated the “FishWisher Rotation Method” of buddy fishing on my boat just a couple of hours before, Ol’ FishTracker didn’t much like reeling in a fish on my rig. I loved it! Now, it was my rig that had hooked two fish. It was pay back time! Now I had one in the box and another on my lure as his rig lay in the rod holder, silent. The exact opposite situation that we faced last year. Rich considered the philosophical quandary for exactly one half second. He grabbed my rod and began reeling in his salmon. This one put up an admirable fight once it saw the boat, and Rich had a great time. Eventually it, too, was at the boat and in the net. It weighted in at 19 lbs. We’d caught two fine salmon for one day’s fishing that totaled 60 pounds! This trip was worth every minute of the prior early trips that just didn’t produce. The adventure that Rich and I shared will never be forgotten. Great philosophical discussion took place as we continued fishing for salmon #3. We were feeling mighty smug with those two big salmon in the box, and we talked at length about what put them there. Was it the Blue Fox and the blue Wiggle Wart that did it? Was it the right trolling speed? Was it trolling upriver or downriver that mattered most? Was it the time of day? We decided that it was two things. First, we were just flat out dumb lucky enough to have the lures wind up in the face of those two salmon. We’ve decided that that’s the main ingredient required for catching salmon. Secondly, we had been at the right depth. While some very experienced salmon trollers may believe that the lure should be very near the bottom, that theory didn’t work for us that day. Rich’s lure was near the bottom most of the day, his lure hit the bottom often. My lure was somewhere around six to eight feet deep, I believe, and the water depth was usually twelve to fifteen feet. We think that it is better to have the lure above the fish, not below it. Rich concurs, and he’s done a lot more salmon fishing than I have. It seems to me that the fish can see above it’s position in the water column because of the sunlight above, but cannot see well below due to the darkness. Most of all, we were just mighty thankful for our good luck. Next week I’ll be out there once again trying for the salmon. My faith has been restored! 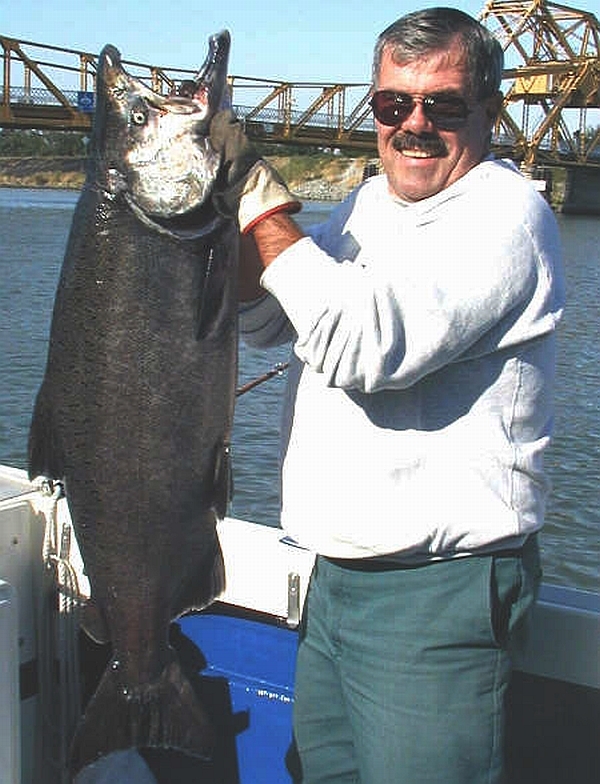 This entry was posted in Fishin' with "FishTracker" Rich, Fishing Salmon. Bookmark the permalink.